Those of you who are in Exeter California and need garage door repair we want to thank you for visiting our site. Our company, Garage Door Repair and Installations Company is a local garage door repair company that is focused on providing the highest quality of garage door repair services possible. Additionally, our garage door company only sells quality garage door products that we know we can trust. 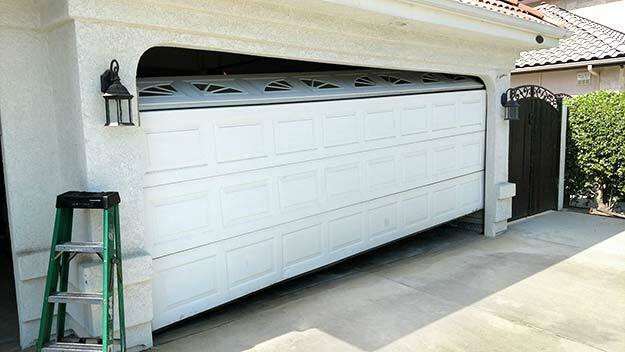 We will repair all makes and models of residential garage doors. If you are in need of immediate assistance with your garage door, call us. We look forward to making you another one of our happy clients. Our company philosophy is that quality products and service should not cost you a fortune. Unfortunately not everyone else shares the same point of view. The garage door industry has some bad actors, including both manufacturers and services companies. This garage door repair section will hopefully help you choose the right garage door products and repair company. Every garage door has sensors at the bottom that are designed to keep you and your loved ones from being injured. There is a sensor attached to the wall on each side of the garage door about 6 inches off the ground. These sensors have an infrared light that beams from one sensor to another. When there is an object blocking the infrared beam, the garage door will not close. When garage door sensors are not aligned properly, this will cause the garage door not to shut. Our company has been out on more service calls than we can count due to a simple misaligned sensor. Sensor alignment is something most people can check on-their-own. We would recommend checking for proper alignment just to save the service call fee. Garage door springs break more often than any other garage door part. Garage door springs help carry the weight of the garage door so the garage door opener (motor) does not have to carry the full load. Garage door springs vary in quality, size, and type. You should not use your garage door if you have a broken garage door spring. Garage door spring replacement is one of the most common types of service calls we receive. Our garage door repair company will be able to quickly replace the broken springs at an affordable rate. Garage Door Repair and Installation Company is the best company to hire in Exeter for garage door installation. We will first show you the doors we have available and do an on-site inspection. This is when we measure for the door, assess the space, and take into consideration any other variables. Once you have chosen a door, we will pick up the door from our distributor. We will then schedule a time to install the garage door. Attention to detail is essential when installing garage door. When we install a garage door we make sure each and every nut, bolt, and roller is secured properly. We want to make sure you are 100% satisfied with the garage door installation project. Our company repairs all brands, makes, and models of garage doors. However, we do not sell or install all types of garage doors. Garage Door Repair and Installation Company only sells brand names that we are confident will perform up to our standards. CHI Overhead Doors makes some of the highest quality garage doors available on the market. They are also affordably priced so any homeowner can afford to have garage doors that look great and last for years to come. We use LiftMaster garage door openers (motors) simply because they are real work horses. LiftMaster openers are top-of-the-line without the top-of-the-line price. We all want a garage door that looks great. However no one wants to have to sacrifice reliability for curb appeal. We use brands that will allow you to enjoy the best of both worlds. We have some of the best looking and quality performance garage doors on the market. One particular garage door manufacturer focuses on making the most aesthetically pleasing garage doors possible. However, that same manufacturer makes garage doors with the cheapest materials possible. The doors look great but all the pieces including the hardware are made from the lowest quality materials possible. The manufacturer uses low quality materials to save money and make more money from the replacement costs. Big box store doors are made so poorly that we will not even install them for homeowners. They always break really quickly. When a garage door breaks quickly and frequently homeowners may think an improper installation is the root of the problem. We have installed big box store doors in the past and do not want our company associated with products of such a low caliber. We strive to be the best garage door repair company in Exeter.